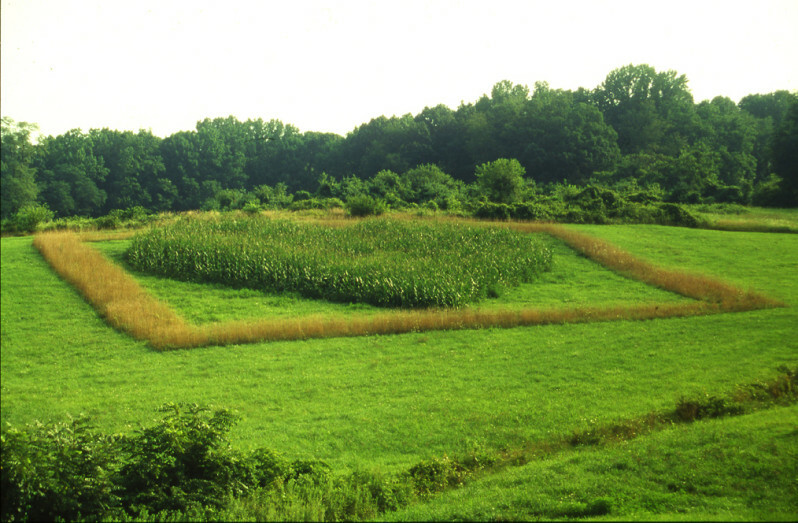 Musician John Cage was asked to summarize himself in a nutshell, and he responded, “Get yourself out of whatever cage you find yourself in.” My work as an environmental artist began as a way of freeing myself from the bonds of traditional landscape architecture, and is now an important part of my professional practice. I do a lot of experimentation in my own garden art home. These pokeweed stems were harvested from our wildflower meadow. The work of artist Keith Haring influenced my own creative growth, and when he died in 1992 I went into our meadow and mowed this tribute to him. 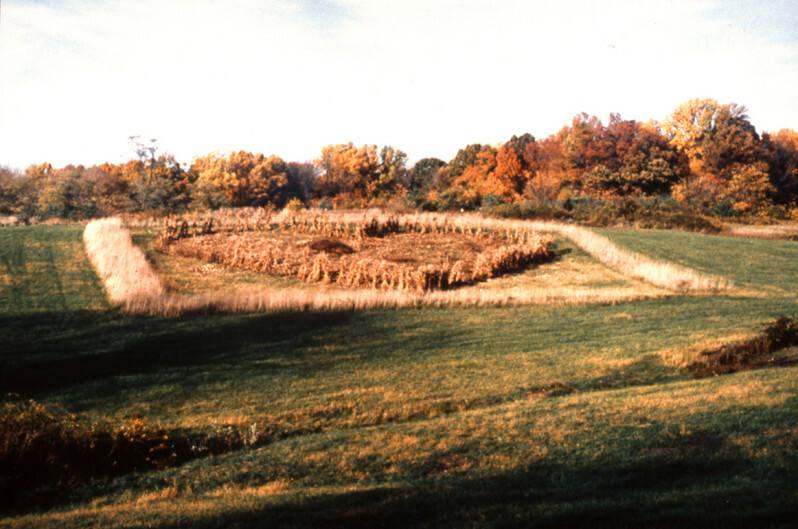 Corn Heart, at the Brandywine Valley Association Myrick Conservation Center in West Chester, Pennsylvania, was created in 1994 in collaboration with storyteller Annie Hawkins. 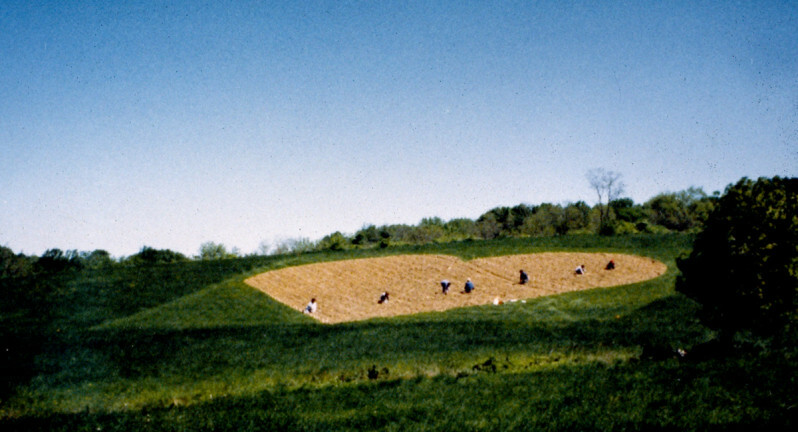 Volunteers tilled the field and planted the seeds. Corn Heart, after the harvest. 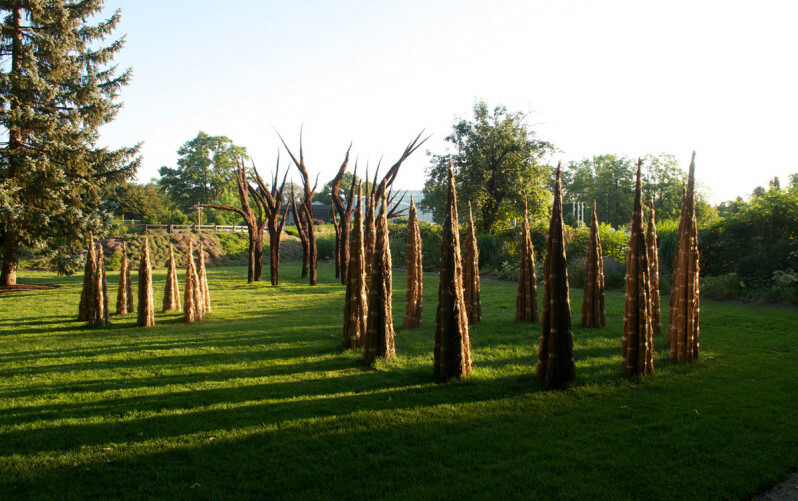 Stooks and Peunes was installed in 2011 at the Toronto Botanical Garden on the site of their future children’s garden. 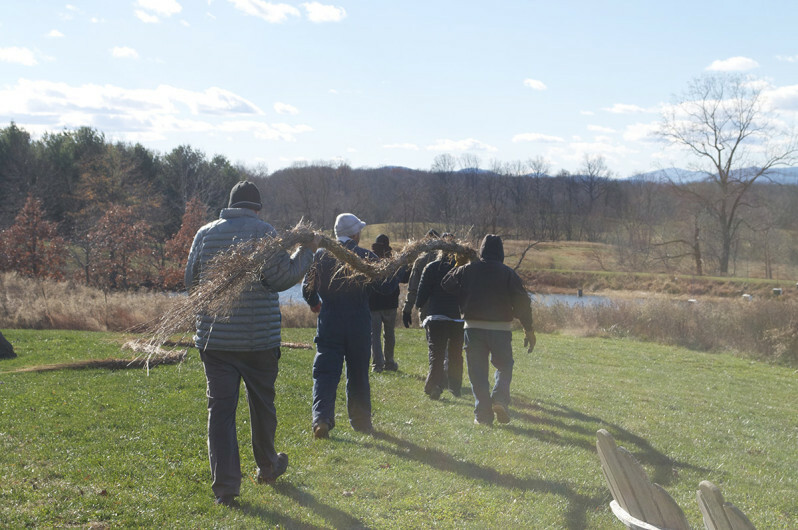 Stooks and Peunes was made from shrub dogwood and curly willow stems. 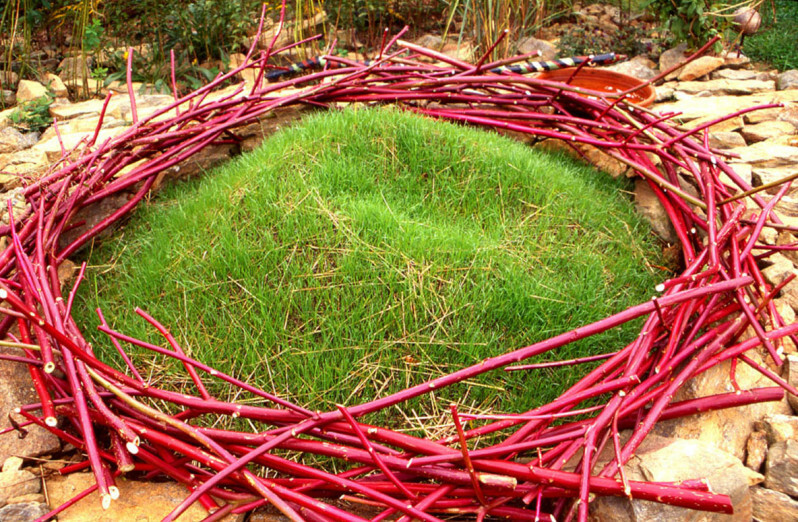 Created in 2011, Against the Grid was in the Créations-sur-le-champ (Land art) exhibition in Mont-Saint-Hillaire, Quebec. 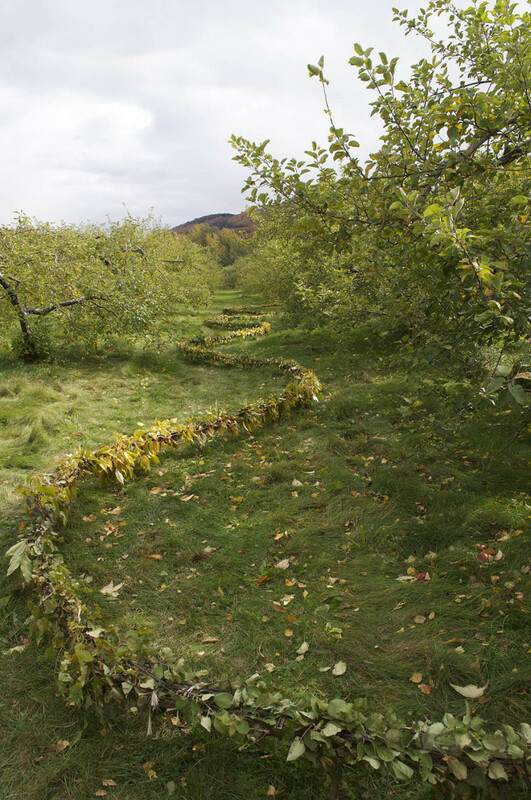 This annual show takes place in a commercial orchard near Montreal, with a selected group of artists creating site-specific installations that use materials harvested from the area. 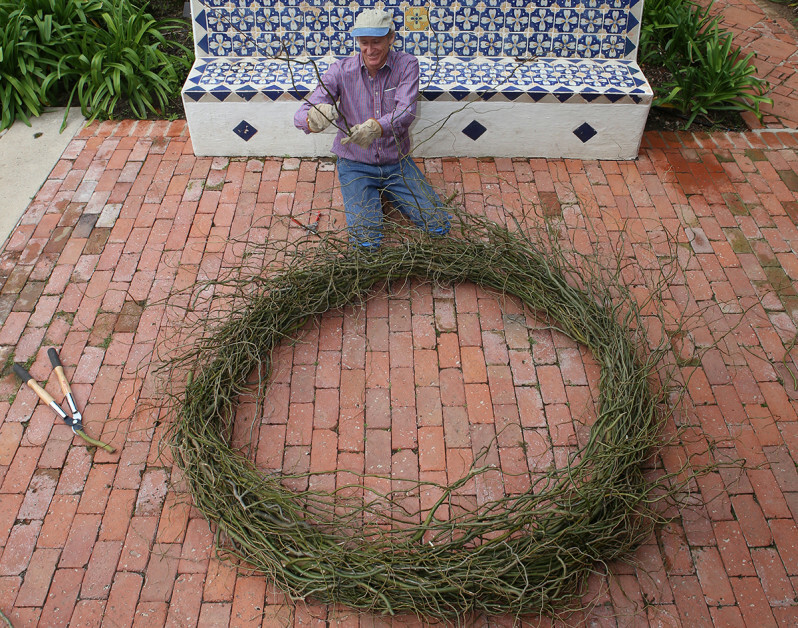 I made the piece from brush that was harvested along the edges of the orchard. 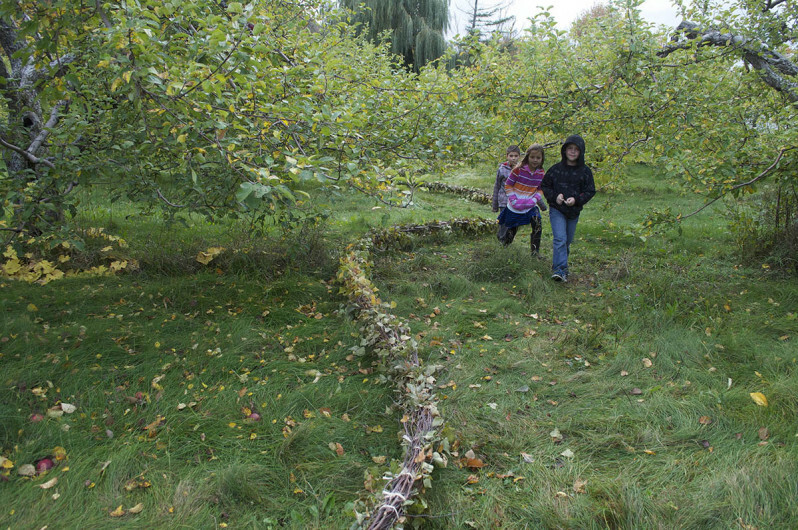 The serpentine line of nature played against the industrial grid of apple trees. 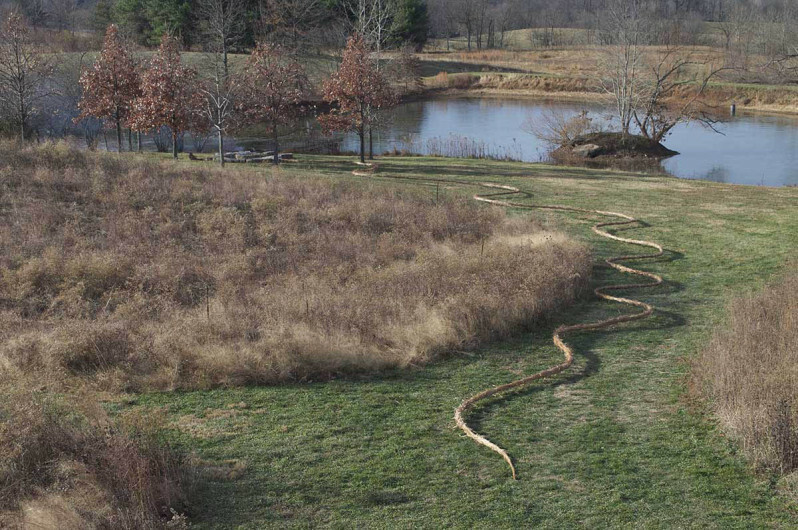 Meadow Snake, made in 2013, was featured in a New York Times article about my design for the Gibbens estate in central Virginia. 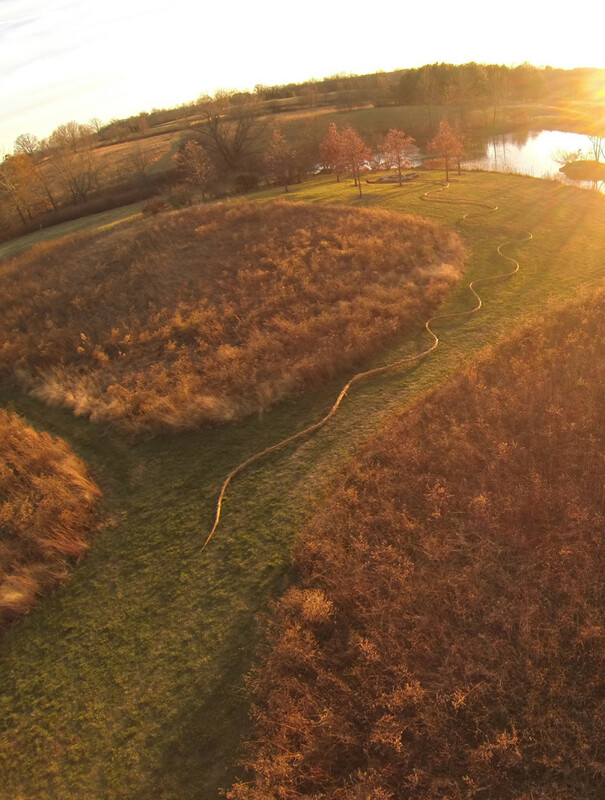 Meadow Snake as seen from a drone camera. 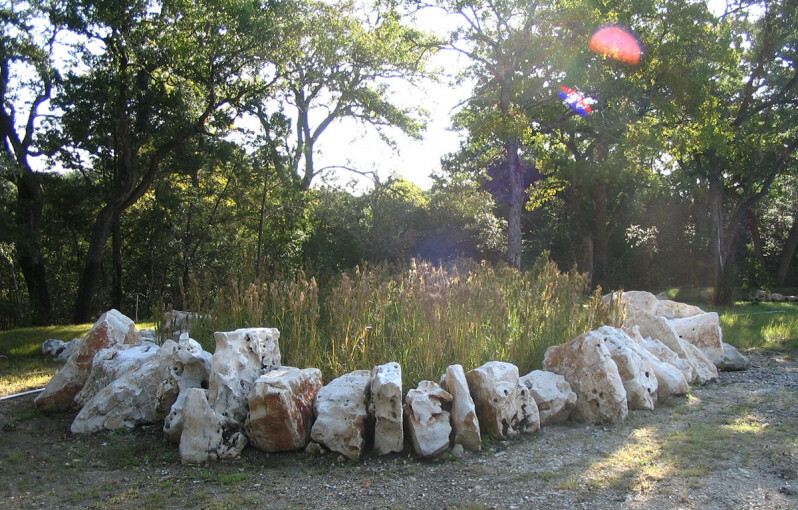 Meadow Snake was fabricated by members of the Gibbens family and other volunteers. Karst Circle was created in 2005 for the new Circle C Fire Station in Austin, Texas. It is now a permanent piece with the Austin Art in Public Places program. 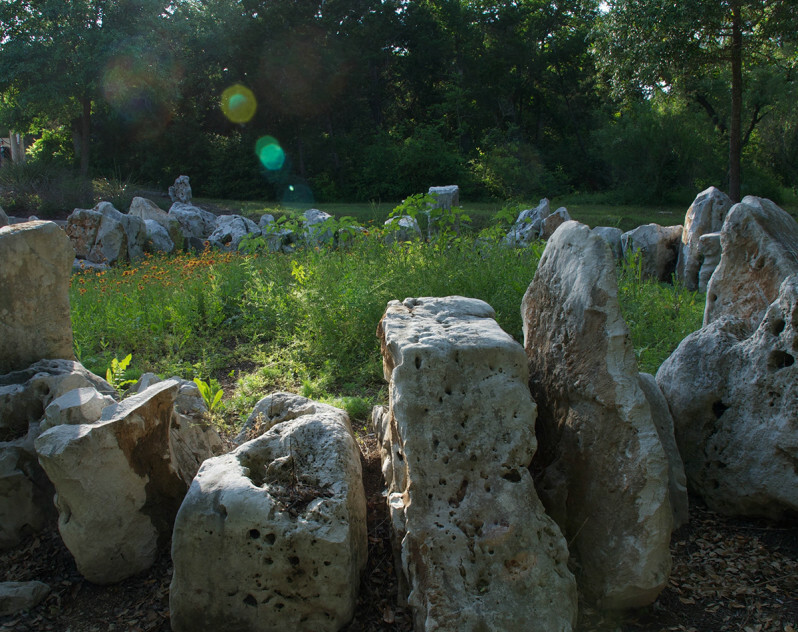 Karst Circle is made of karst limestone boulders, which are part of the bedrock beneath Central Texas. Karst’s permeability is one reason that groundwater protection is so important throughout the region. 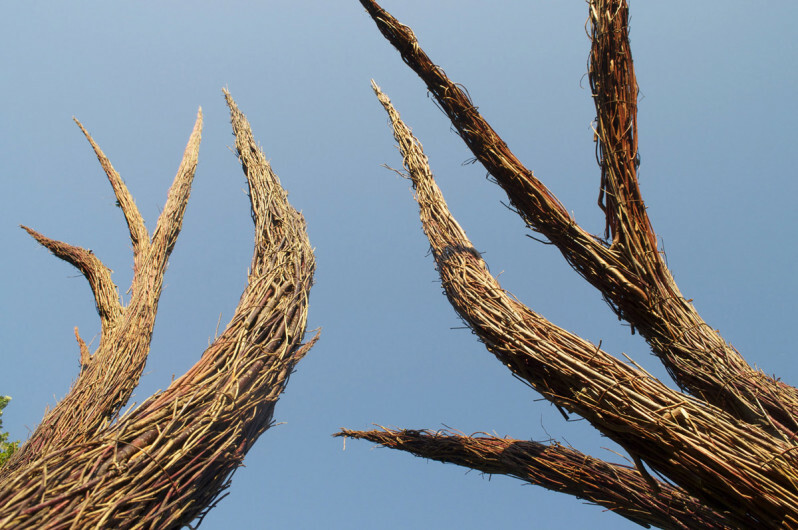 Made in 2015, Curly Willow Nest was commissioned by Ganna Walska Lotusland in Santa Barbara, California, for their art exhibition “Flock: Birds on the Brink”. 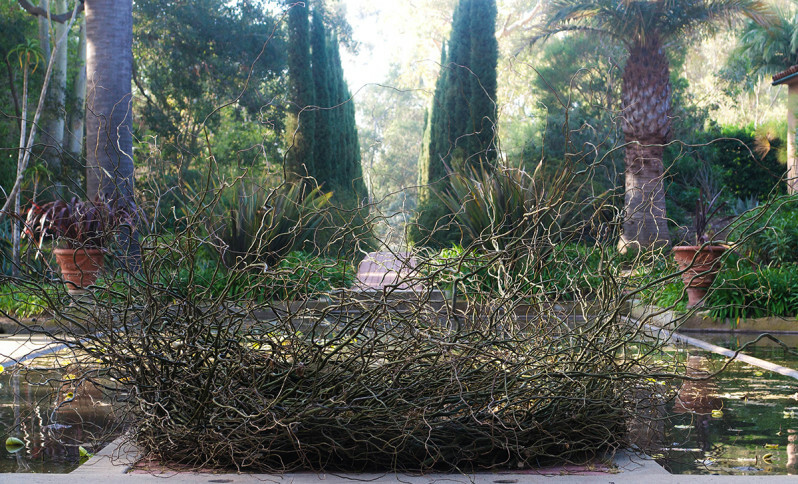 The material for Curly Willow Nest was harvested from the site during regular midwinter pruning. 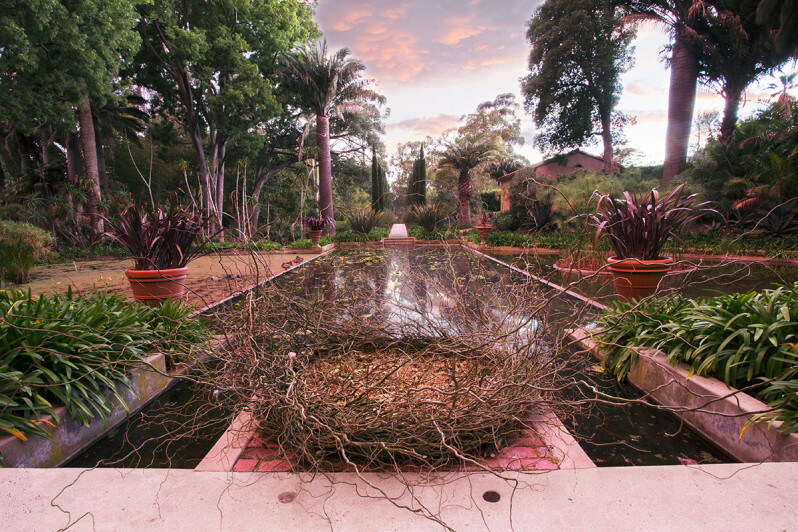 Curly Willow Nest was located at the edge of the Water Garden.